A stunning and challenging puzzle featuring cottage garden plants. A colour wheel can be a useful aid for gardeners, prompting new ways to use nature’s wonderful hues. Every gardener uses colour in a different way – think of Vita Sackville West’s great white garden at Sissinghurst, or Christopher Lloyd’s adventurous use of vibrant tones at Great Dixter. 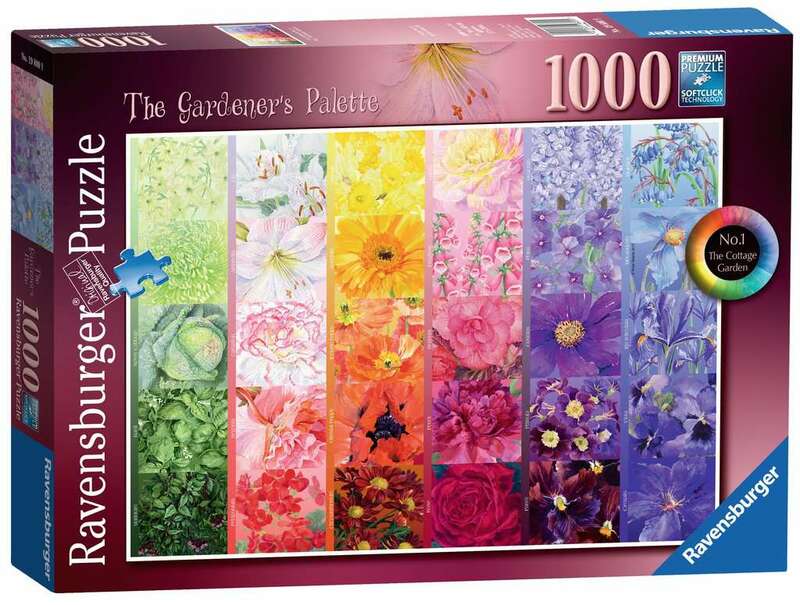 This challenging puzzle captures some of the marvellous colours that plants can deliver, presenting them in graduated tones, ranging from the most delicate tinges to rich deep shades. These cottage garden beauties include herbs, vegetables and flowers, and each one is named to help with identification. Who knows, this wonderfully illustrated jigsaw may even tempt you to try some of them in your own plot. High quality 1000 piece cardboard jigsaw puzzle. The finished puzzle measures 70 x 50cm when complete. Suitable for ages 12 years and up. Made from strong premium grade cardboard, with linen finish print to minimise glare on puzzle image. At Ravensburger we have over 50 years’ worth of experience in the manufacture of puzzles. Not only do we make the best selection of puzzles, we also pride ourselves on having the highest quality. Individual pieces are stamped with such precision that a quiet "click" can be heard when one piece is inserted in the other - this phenomenon is so unique that we have given it its own name ‘Softclick Technology.’ Our puzzles are made using unique punching templates and punching tools, which are hand-crafted with watchmaker precision to ensure the greatest possible accuracy and variety of the puzzle pieces.